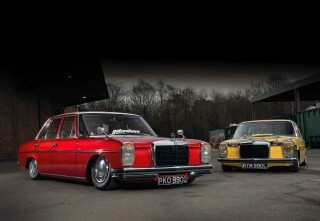 Mega Mercedes 3-way Race, custom and show cars - we’ve got the lot! In a past life, Paul Aveil was a linchpin of the 1980s Chelsea Cruise. 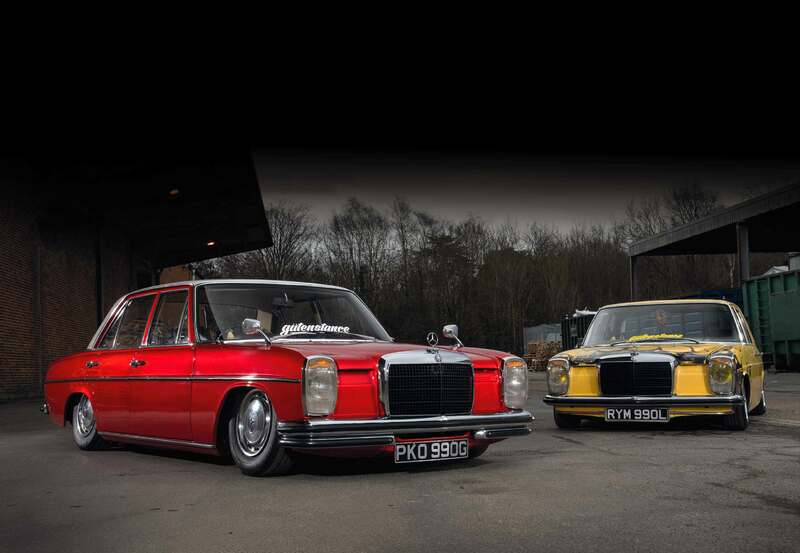 And when his son James decided to bag an old Merc, it rekindled all sorts of old memories… Words: Dan Bevis. Photography: Matt Richardson. The father of this duo, Paul, is an engaging 61-year-old petrolhead; once you sit him down and quiz him about his automotive history, you’ll need to make sure you’ve got a couple of pints and some comfy chairs. 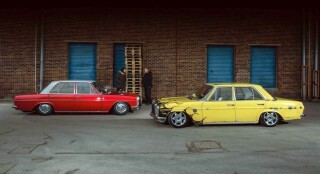 “My first car was a Corsair 1700 V4 – which I wrote off!” he begins. “Second was a Corsair 1500GT – which I also wrote off. I soon learned that slowing down a bit would be more economical on the wallet! Recommissioning the car turned out to be relatively easy, thanks to how solid and honest it was; the inner rear arches needed refabricating, new front floorpans were welded in, the brakes were rebuilt with new lines, and a pattern wing replaced a too-far- gone original. The rear subframe and diff came out to be rebuilt and painted, the underside was stonechipped and painted, the carbs were tweaked, and the job was a good ’un. And how! After three months of solid graft on the driveway, the patinated yellow Merc now has a full custom interior, sporting a hand-crafted copper pipe dash, fully smoothed floors and tunnel, a bonkers cut-down steering wheel with the air-ride controls recessed into it and, as a last-minute addition, one that finishes off the ethos a treat, a pair of RAF bomber-style metal seats. After all of this work together out on the driveway, what these fellas have ended up with is a pair of retro Mercs, similarly specced on paper and yet startlingly different in character: James’s features a flawless, show-stopping exterior finish paired with luxurious vintage innards for low-and-slow cruising, while Paul’s is an in-your- face rebel with unapologetically patchy paint and one of the coolest interiors we’ve seen for a long time. Together they air out with more finesse than most customs on the scene, and it’s the passion within each build that makes the pairing so very special. We’ll see you on Chelsea Bridge, okay lads?